Nothing works up an appetite quite like a long hike. Capture photos of your family enjoying a picnic or grilling up a storm at one of the Park's picnic areas, or eating lunch at the Park's restaurant Old Rock Caf�, and enter them into our fall photo contest. We'll use the winning entries on our website and Facebook album, and you'll win some fun prizes. Photos must be taken within the Chimney Rock section of the Park or at Old Rock Cafe. Second Place�� A Chimney Rock prize package including two passes to Chimney Rock, lunch for two at the�Old Rock Caf�and two tickets for a tour with�Lake Lure Boat Tours. People's Choice ��Selected by our Facebook fans, the winning photo will be featured as the cover photo of our Facebook page for two weeks and the cover of our Pinterest board of winning photos. Prize includes two Park admission tickets, lunch for two at the�Old Rock Caf�and a $20 gift certificate for�Old Time Photo�in Chimney Rock Village. There is no fee to enter the contest. All photographs must be taken inside Chimney Rock at Chimney Rock State Park only in areas accessible to guests between Sept. 22, 2018- Nov. 30, 2018. The contest is open to amateur and professional photographers. Facebook: First, like the�Chimney Rock at Chimney Rock State Park�page and share our photo contest post on your wall. Then post your photo to our wall with the photographer's name and a brief caption (25-75 words) through your personal Facebook account. Next, send us a private message including your contact information specified in rule #3. Pinterest: First, re-pin our photo contest pin to one of your boards and follow our 2017 The Different Seasons of Chimney Rock Spring Photo Contest Board so we can easily contact you. 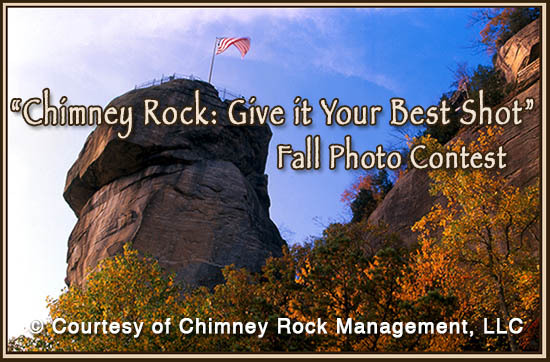 Then pin your photo with the hashtags #chimneyrock AND #photocontest with your personal account, and include the photographer's name and a brief caption (25-75 words). Twitter:�First, follow�Chimney Rock Park�and retweet our tweet about the photo contest. Then tweet your photo to @ChimneyRockPark with the photographer's name and the hashtag #photocontest. Next, send us private messages with your brief photo caption. E-mail:�If you don't have access to any social media sites listed above, you may email your digital photo with your contact information specified in rule #3 to�visit@chimneyrockpark.com. Snail Mail:�Send your print photo with the clearly marked photographer's name, city & state, a brief typed photo caption and a phone number to: Photo Contest, Chimney Rock Management LLC, PO Box 39, Chimney Rock, NC 28720. Every entry should be clearly labeled with the photographer's name, city & state, a brief photo caption your photo of the Seasons of Chimney Rock, an email address and the best phone number to reach you. Entries should reflect the photographer's interpretation of a face of Chimney Rock. Emphasis will be placed on quality, composition and creativity. All entries may be used in promotions of Chimney Rock and park-related activities. For more information, call 1-800-277-9611 or email us at�visit@chimneyrockpark.com.